A brazen lorry driver dumped a skip onto the middle of a busy motorway before fleeing the scene. 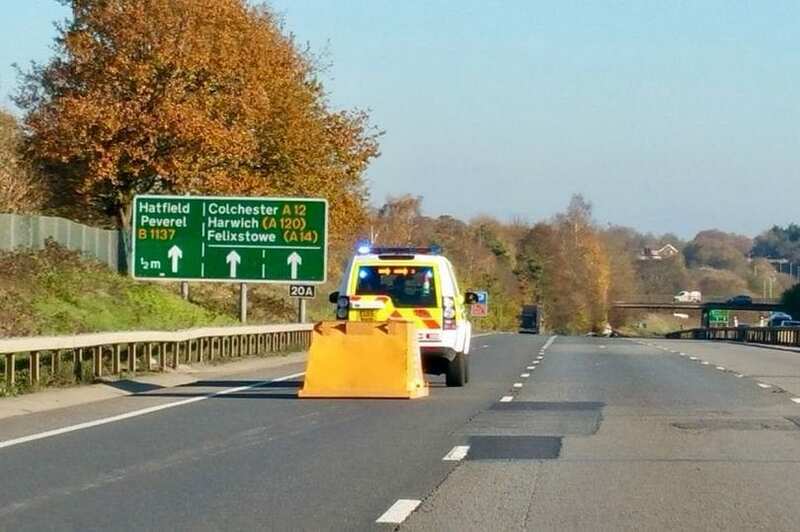 Emergency services and highways officers rushed to a section of the three lane A12 in Essex after drivers reported the large yellow skip falling off the back of a lorry. The incident caused chaos and delays after the skip stopped traffic moving and nearly caused a horror crash. Police officers arrived at the scene shortly after 11am yesterday (November 18). It took place between junction 19 for the Boreham Interchange and junction 20 for Hatfield Peverel in Essex. Jane Oxby who drove past the dumped item, said: “I saw the skip. It was indeed upside down by the side of the road with two police officers standing guard. Another driver Jean Marven said: “I was on that road this morning (Sunday) coming towards Hatfield peveral. The skip was later removed from the road by officers who moved it over to the hard shoulder. One lane of the northbound carriageway was then closed until the skip could be removed completely by highway maintenance. Sgt Shead added that the driver had not stopped after it fell off their lorry and enquiries are currently on-going.